KNOWN AS THE Cornhusker State, the west northcentral state of Nebraska was named from a Native American word meaning “flat or broad water.” It lies within the Missouri River basin; the western part of the state also lies within the Platte River basin. 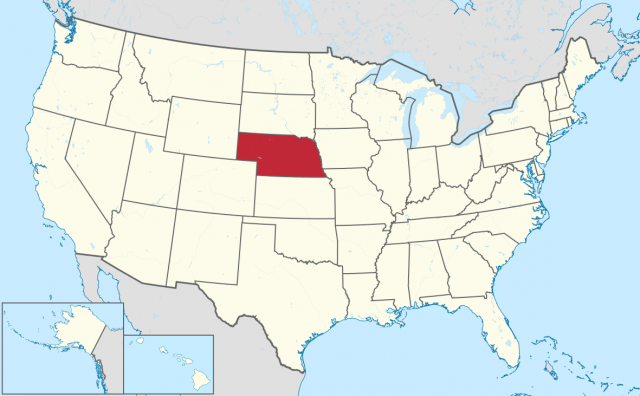 Nebraska covers an area of 77,354 square mi (200,346 square km), making it the 16th largest state in the UNITED STATES. Nebraska is 38th in population among the 50 states. The state is 430 mi (692 km) east to west and 210 mi (338 km) north to south. Some 95 percent of Nebraska is devoted to agriculture in some way. Nebraska makes up the westernmost edge of North America’s Central Lowlands and is part of the Great Plains. It is bounded on the north by SOUTH DAKOTA, on the south by COLORADO and KANSAS, on the east by IOWA and MISSOURI, and on the west by Colorado and WYOMING. Nebraska entered the Union in 1867 as the 37th state. The state capital is Lincoln. Other large cities include Omaha, Bellevue, Grand Island, Kearney, Fremont, Norfolk, North Platte, Hastings, and Columbus. The highest point in Nebraska is 5,424 ft (1,653 m) above sea level in Johnson Township; the lowest point is 840 ft (256 m) above sea level at the Missouri River in Richardson County. Much of Nebraska’s topography is dominated by till plains, with lowlands evident in the eastern third of the state, which is part of the Dissected Till Plains that extend to the Great Plains in northern Nebraska. The Dissected Till Plains are characterized by rolling hills dotted with numerous streams and rivers, providing the richest farmland in the state. Nebraska’s Great Plains contain the Loess Hills, made up of loamy dust distributed by the wind, varying in color from buff to a yellowish brown. The terrain is rough and hilly. In the Loess Plains that lie in the southeastern part of the region, the land is flatter and more conducive to farming. Because of its frequent rainfall, this area is sometimes called the Rainwater Basin or the Rainbasin. In LOESS areas of Nebraska, silty soils that are conducive to farming are the most common. In the eastern third of Nebraska, soils are more likely to be low-permeability clays that make irrigation difficult. A 20,000-square-mi (51,799-square-km) section of Nebraska lying north of the Platte River is known as the Sand Hills, which is the largest area of sand dunes on the North American continent. Abundant grass and readily available water from the hundreds of lakes found throughout the area make this area excellent for grazing. Nebraska’s High Plains lie north and west of the Sand Hills. In this dry area, advances in irrigation technology have allowed some farming, while rougher terrain is used for grazing. Nebraska’s badlands are located in the northwestern section of the state. Distinctive formations have been formed in the badlands by wind and water. Nebraska’s climate is continental, resulting in hot summers with frequent thunderstorms and occasional hail and tornadoes. Harsh winters are accompanied by an annual snowfall of 29 in (73.6 cm), with occasional blizzards. The state is somewhat drier than other midwestern states. Average temperatures range from 89.5 degrees F (32 degrees C) in the summer to 8.9 degrees F (-12.8 degrees C) in the winter. Annual precipitation ranges from 33 in (84 cm) in southeast Nebraska to 18 in (45.7 cm) in the west, resulting in a growing season of 170 days in the southeast and 120 days in the northwest section of Nebraska. Draughts are common. Nebraska’s largest rivers are the Missouri, the Niobrara, the Platte, and the Republican. The state’s largest lakes, including Lewis and Clark Lake, Harlan County Lake, and Lake C.W. McConaughty, are man-made. Recognized as a major grain producer, Nebraska’s approximately 48,500 farms and ranches produce corn, sorghum, soybeans, hay, wheat, dry beans, oats, potatoes, sugar beets, and livestock. Nebraska is also home to the greatest number of forage grasses in the country. Natural resources include oil, natural gas, cement, stone, sand and gravel, and lime. Manufacturing in Nebraska is dominated by processed fuels, industrial machinery, publishing, electric and electronic equipment, metal products, mobile homes, pharmaceuticals, chemicals, and transportation equipment. Oak, hickory, and elm trees are plentiful in the river valleys of Nebraska’s east, and cottonwood and willow, as well as elm, are found in the west. Ponderosa pine predominates in the Great Plains area. Bluestem grasses are most commonly found on Nebraska’s prairies, while grama, buffalo, and sagebrush grow in Nebraska’s dry Panhandle. Sand sage and grama grow throughout the southwest. Nebraska’s wildlife population includes the coyote, antelope, deer, fox, badger, prairie dog, pheasants, and quail. Bison are found in isolated areas of the state.